We don’t have to go to school, eat all our vegetables or do what anybody says just because they say so. We can buy all the sugary cereals we want (so says the giant box of Cinnamon Toast Crunch in my pantry), stay up way past our bedtime and watch R-rated movies. But being an adult also has its downfalls. All the things we dreamed of as children — careers, houses, cars, etc. — come with hefty price tags. 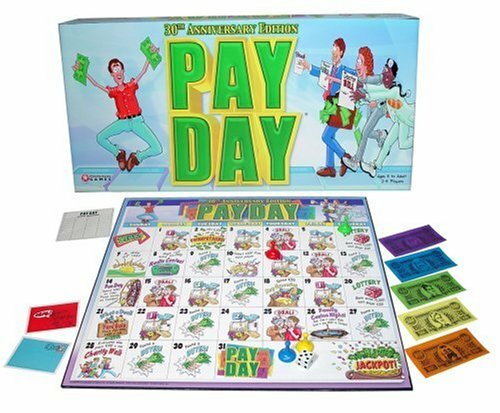 As a kid I had this board game called “Payday” that I absolutely loved. Players moved their pieces through a calendar month, trying to make money with risky investments while also paying for bills, groceries, and other incidentals depending on what spaces you landed on during the course of the game. The goal was to get to the end of the month without going broke so you could get your “Payday” and start the month all over again. I couldn’t figure out why my parents hated playing that game with me until a few years ago when my pal Toni hunted down a copy for my birthday so we could relive our glory days. Five minutes in, I realized some sick individual had made a game out of every adult’s struggles to earn money while covering our financial responsibilities. That’s not a game, that’s just called being a responsible grown-up and it blows. What weirdo would make that into a fun activity for kids? How do you pay your bills, bills, bills? Are you working nine to five (what a way to make a living), at a full-time job outside of writing? A lot of us author folks have no choice but to work at a real job so we can find a way to pay for the roofs over our heads, clothes on our backs and food on our tables. What if we could all achieve that golden dream of actually doing what we love for a living? The good news is it’s possible. The bad news is, it ain’t easy. To help you figure out if a financially successful author career is for you, we’ve put together six laws you must abide by if you want a shot at having your cake and eating it, too. Start by figuring out how much money you need to make each month to sustain yourself. Don’t just add in the bills, groceries, and gas – you have to have some spending money as well (everybody needs a movie ticket, new CD or new purse every once in a while!). Making the jump from writing as a hobby to writing as a career requires a change in mindset. Leave behind the notion that writing is a passion you squeeze into your spare time and acknowledge that you are running a business. You will have to get hands-on with all facets of your career, not just the writing part. From proofreading and editing to public relations and marketing, you are the CEO who makes the decision. Educate yourself as much as possible so you can run your business with the confidence of a visionary leader. What’s your first decision as CEO? Long term success requires a line of products, not just one. One book isn’t going to cut it. The best business model for a career author involves multiple books spaced out so that each one builds off the momentum of the last one like falling dominoes. Hook your readers in with one book and keep them coming back for more to sustain long term sales and growth. Your books don’t have to be part of a series, but your genre and writing styles should be similar so that your author brand becomes familiar to your readers. Not sure how you will have the time to do all that? That’s why it’s a full-time job. When you announce to your family that you’re going to become a full-time author, they will assume you plan to spend your days sleeping in and shopping at Target. But right in line with Law #2, a successful author has to treat his/her career as a business and put in the time accordingly. You might not work from nine to five, but you’ll definitely find at minimum that forty hours a week split between marketing and writing is necessary. You may even need to put in a little more time, especially in the beginning, to get your blog/website/social media tools in order so that you can begin building the foundation of your writing career. Don’t like marketing? Tough cookies, my friend. For career authors, marketing and writing go hand-in-hand. You can’t get around it, so just accept right now that you will have to take the lead in promoting your books on and off the internet. It will soak up part of your writing time and drain some of your resources, but it’s necessary. Because it’s a required component, it’s best to adopt a positive attitude about it from the get-go and learn how to love your marketing. It helps if you work on forming relationships with your fans, instead of feeling like you constantly have to sell to them. Engage first, sell later! And what happens on the days when you just don’t feel like it’s working? Take the word “impossible” and toss it out of your lexicon right now. If you plan to be a career author you have to work hard for that dream every day, rain or shine. It won’t be easy, but it’s your dream and if you’re willing to work for it, it can be achieved. Push yourself and on the days when you run out of energy, make sure you have a good support team around you who will step in to keep pushing. Being a full-time, financially successful author is definitely within your realm of possibility if you follow these six laws (and probably a few more we haven’t thought of). Are you currently trying to make it as a full-time author or do you know someone who is? What lessons have you learned along the way? What would you do differently if you had the chance? If you’re dreaming of leaving your day job to become a full-timer (I know I am!) what’s holding you back? What goals can you set for yourself to move closer to your dream? And for both the current and soon-to-be career authors, what can Duolit do to help you out along the way? These are some great points. Another one that I’d add is that you have to take your job seriously in order to train those around you to take it seriously. That is very true! I started to mention that your family will probably think you’re being a slouch, but you have to show them it’s a serious career choice. Great point Celeste! Great article with good advice! It took me the better part of one year to switch from freelance writing income to full time book income. Book income is better because it’s passive. Writing more books is the key. Write, write, write! Wow Connie, congrats on making the transition! It’s tough to get started but I’m sure it feels great when you’re able to make a living doing what you love. Is there any other advice you would share with authors trying to make the jump? My advice would be start writing book 2 as soon as book 1 is finished. I waited several months in-between to see if the first book would have success. When it did, I wished that I had been working on a follow-up book. That’s great advice — you can piggy back on the success of book one with a well-timed release of book two and even plug it with the first chapter of book two in book one. Great tip! Aahhh… wonderful advice all around. Thanks to you all! Connie, congrats and best of luck! I appreciate your advice about starting book 2 right away. My first novel was published in May, and I was tempted to concentrate solely on the marketing aspect — but new characters wouldn’t leave me alone. Now I’m trying to balance work, writing, and marketing. I can’t wait to get to where you are! Thanks again. I really needed this boost. No problem Sylvia! I know we all have those days when we need a little kick in the pants. Great advice and sooooo true! Believing you can do it is half the battle!! Can I add #7 Be Polite? It’s strange, but one reviewer on a BIG website told me that many indie authors “expect” a review and don’t say thank you. (YIKES) Anyone else hearing that???? Lauren I’m totally on board with #7! That is critical — indie authors (and traditional authors for that matter) are not entitled to success, we have to earn it and we should show appreciation for the folks who help us get there! While these are points specific to a career writer, they certainly work for any author. Because writing is a business for many of us, it has to be treated as such, regardless of whether we intend to do a follow-up book/story or not. At least I think so. That’s true, it’s a business across the board, A.T.
“If you can dream it, you can do it!” That says it all for me. Nice inspirational yet realistic posting. Thank you for sharing this! I’m an aspiring author with a novel in the works…hoping to make this my career at some point! A wonderful article and a good set of laws. I hope to one day become a full-time author but at this juncture, it’s still early. In regards to the game Pay Day, I’d really like to see them update the game as most people get paid twice a month and not once.